Moorestown resident and parent Michelle Megargel started Moorestown Rocks last month. If you’ve stumbled upon a painted rock hiding in Moorestown recently, you’re not alone. Maybe you left it alone, or maybe you picked it up and placed it somewhere else later. You may have been playing a game without even knowing it. This is all part of a movement called Moorestown Rocks. 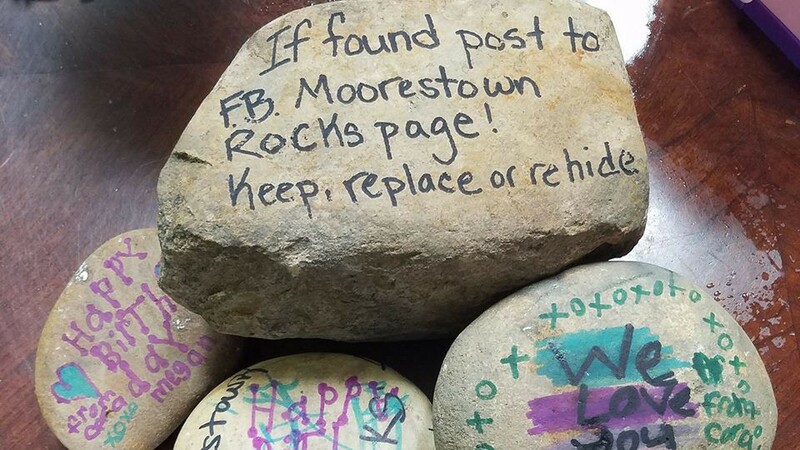 Local parent and Moorestown resident Michelle Megargel started the “Moorestown Rocks” Facebook page about a month ago, which now has more than 100 members. When Megargel saw similar groups in other towns, she saw it as a creative and inexpensive way to have fun with her kids while teaching them the value of giving a smile. With all the parks and shops Moorestown has to offer, Megargel couldn’t pass up the opportunity to bring the project to the community. The game is simple. If you find a rock, you can keep it, leave it where it is or re-hide it. If you decide to keep a rock, it’s encouraged you paint your own rocks to leave around town as well. When painting rocks, be sure to add #MoorestownRocks to the back of the rocks so whoever finds it can find the Facebook page and join the fun. Participants can also post hints in the Facebook group to help others find the rocks they hide. The only rule is to be careful when hiding in grassy parks and medians, as the rocks can become dangerous projectiles if hit by a mower. Some tips posted on the Facebook page include using acrylic paint and smooth rocks, using spray paint on the rocks for a quick base color and finishing with clear spray paint or varnish. Megargel’s children, 2-year-old Megan and 5-year-old Mason, were immediately interested in the game. “My son is so torn between wanting to keep his own rock that he creates and wanting to know if anyone found his rock that he hid,” Megargel said. Preschoolers and kindergarteners at Puddle Jumpers Academy in Moorestown were ecstatic to find a rock hidden at the school. “We brought the rock in and we actually had it for a day on their playground so everybody else could see it, and then we went ahead and had two of our students go and hide the rock at one of our neighbors,” owner Lori Cassidy said. Cassidy feels Moorestown Rocks is the perfect way to establish a sense of connection between students and the community. The game isn’t confined to Moorestown, though. One of Megargel’s goals was to see how far the rocks can travel. She encourages participants to take the rocks to neighboring communities and even on vacations. While the rocks can be purchased at home improvement stores, Megargel encourages people to find them in nature to decorate and relocate. Megargel’s biggest challenge has been overcoming the idea that it’s wrong to touch something that doesn’t belong to you.